Rock Solid. No Shackle Required. Each Habitat Mooring is manufactured in Maine and is poured with high density, fiber reinforced concrete rated at 5,000 psi. 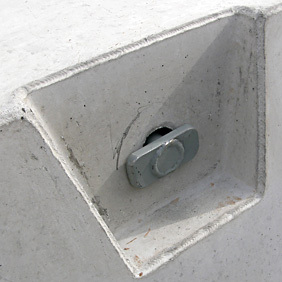 The span of concrete that holds the hitch rod provides exceptional strength and is rated for shear load of 65,000 pounds for the Standard Series, and over 120,000 pounds for the heavier Low Profile Series. 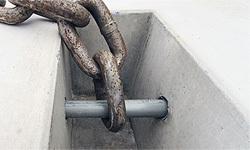 The ground chain threads directly onto the hitch rod, so there’s no need for a shackle – a cost savings of $40.00 to $60.00. Hitch rod is easy to maintain. 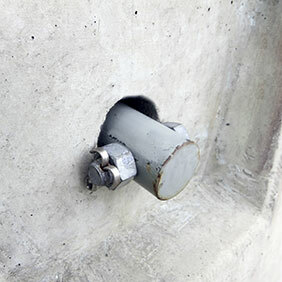 Both the Standard and Low Profile Series of Habitat Moorings feature a patented hitch rod system that conveniently allows a ground chain to be threaded directly onto the hitch rod, thus eliminating the need for a shackle. The hitch rod is so simple to use that a diver can easily change it out underwater, saving time and money.